As usual, work put a stop to all other aspects of my life. I have been off for a couple of weeks now and have rebooted my social life. Thank goodness none of my friends seem to care that I drop off the face of the earth for 5 months a year. The social reboot included a trip to Toronto for a volunteer appreciation lunch. I think it is funny that I am considered a good volunteer for a city 450km from my house, but I am, after all, a Canadian so distance means nothing. I never did post the hats that I made on my trip to eastern Europe in the spring. I couldn’t photograph them there, so I didn’t bother posting them. I started back to work 12 hours after arriving home and …you know the rest (summer time warp). 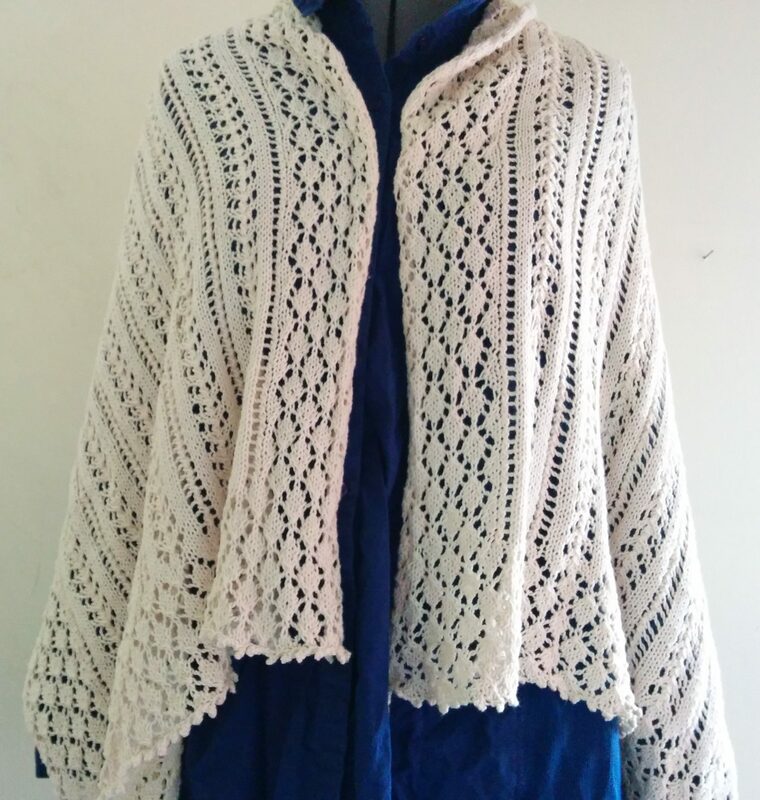 I actually quit knitting for about 4 months and didn’t know if I was going to ever start again, but my friend Lynda decided to retire (yikes), and so I had to knit her a shawl. I had given shawls to other friends on their retirement, so I couldn’t leave her hanging. It took 2 weeks to knit this shawl and it only used 2 stitches Minature Leaf Pattern, pg 215 and Arches and Columns, pg 196 …hats are a lot more work-efficient. Actually 19 front line staff retired altogether. The provincial government changed the retirement rules and we had a mass exodus. It will be interesting to see what comes about next year. It is a bucketload of expertise going out the door. Some are planning on returning part time, but it is a huge shakeup. This entry was posted in Barbara Walker and tagged A Treasury of Knitting Patterns, Barbara G. Walker, Cascade 220, Cascade Bentley on October 8, 2016 by gillianknitter. Another beautiful collection of stitches. And isn’t your friend Lynda one lucky gal in her retirement to receive such a lovely shawl! Welcome back Gillian! I was just thinking it was about time for a batch of hats the other day! Looking forward to seeing where Barbara takes you next! Thanks…that last pair of socks looked hard…I guess they have a seam? No seam! It’s an intarsia panel, in the round, so you do more purling than the average sock, but the pattern is quite elegant and it’s actually pretty easy once you get the trick. Best kind of knitting – looks impressive, but fun to do! It’s a free pattern if you want to check out the details for yourself! I was super intimidated, but they just sailed along. I missed reading your posts Gillian. Glad you’re back. Beautiful work as usual…love the colours.